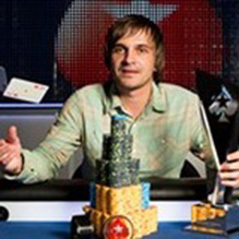 Mikalai Pobol has won the opening event of the new PokerStars European Poker Tour season. The Belarussian pocketed a first prize of €1,007,550 for his efforts after outlasting the biggest field ever assembled for a tournament in Spain. The 28-year-old beat online legend Ilari 'IlariFin' Sahamies heads up to take his biggest ever live score, sealing victory with pocket aces after the Finn's shove with 95s. “I'm really excited about it. I am very tired but very happy. It is my dream which came true. The title means a lot more to me than the money,” said Pobol. Despite falling just short, Sahamies has enjoyed a fine week in the Catalan capital, adding a further €629,700 to the €291,900 he won for his fourth place finish in the €50k Super High Roller event. The European Poker Tour heads to Italy for its next stop with thr San Remo leg running from 5-11 October. Qualify online at PokerStars with a first deposit bonus of up to £400. Sign up here. Image courtesy of Neil Stoddart at the PokerStars blog.